The spirit of puzzly competition is alive and well. Not only are we still basking in the afterglow of the ACPT, but the third round of the World Puzzle Federation Puzzle Grand Prix is this weekend! AND registration for this year’s Indie 500 Crossword Tournament is now open! 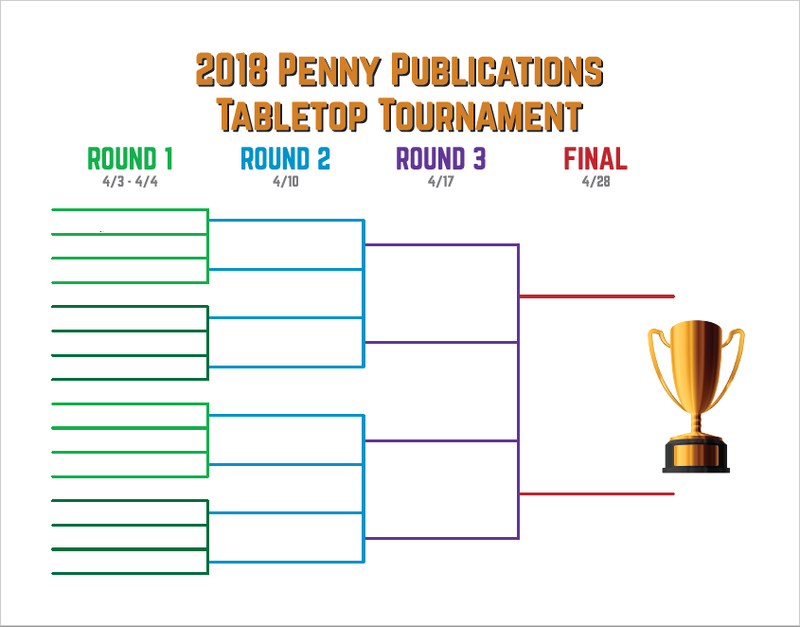 The crew at Penny Dell Puzzles put together a Tabletop Tournament in honor of the upcoming International Tabletop Day on Saturday, April 28. One of the things I liked about the layout of the tournament is that there are no one-on-one match-ups until the final. Instead of a single-elimination tournament, competitors were slotted into groups of four. Each group of four would play two games, and the two winners (one from each game) would come from each foursome and move on to the next round. The two games for Round 1? On the Dot and Bananagrams. 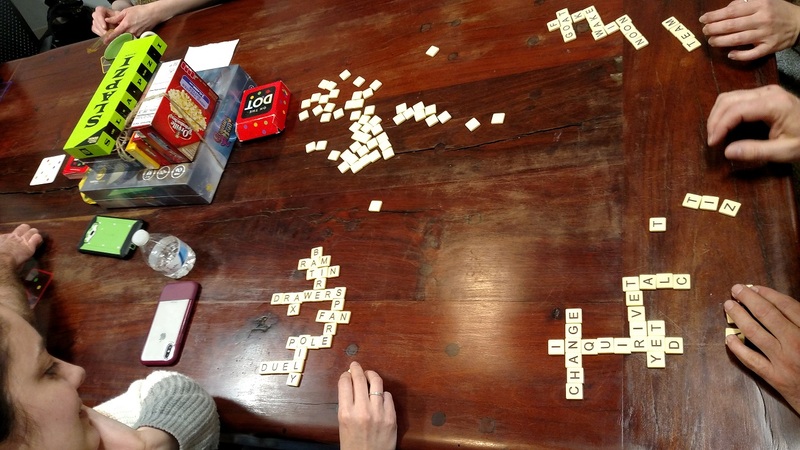 Bananagrams is a tile game where, much like Scrabble, players pull letter tiles and try to form small crossword-like grids. But in Bananagrams, you can anagram and rearrange the grid as needed, instead of being locked into using the words you’ve already played. Each player starts with a certain number of tiles, and each time you’ve used all your tiles, you say “Peel!” and each player grabs a new tile. This continues until the tile pile is depleted. Then the first player to complete their grid and say “Bananas!” is the winner, moving on to round 2. On the Dot is a pattern-matching game. 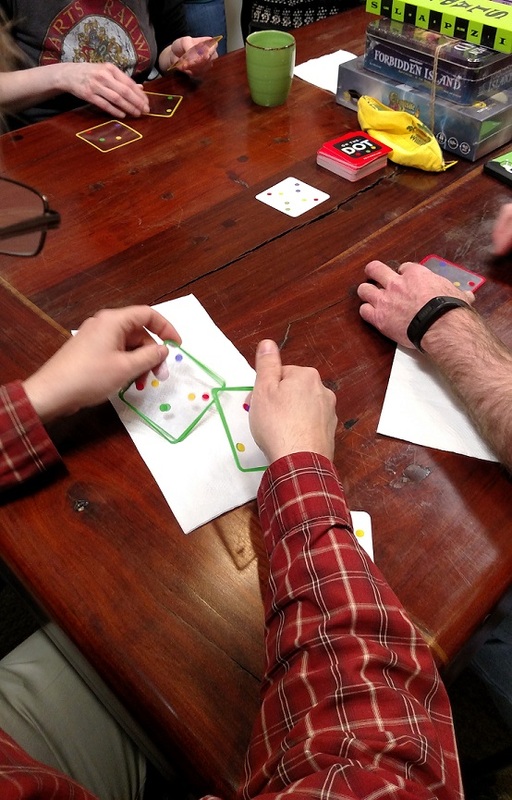 Each player has four clear cards with randomly-placed colored dots on them, and it’s up to the player to arrange all four cards so that the colored dots showing match a given pattern. The first player to match three patterns would move on to the next round. This two-winner-per-group arrangement is nice, because it offers people with different puzzle/game skills multiple chances to move on, instead of a one-and-done scenario. 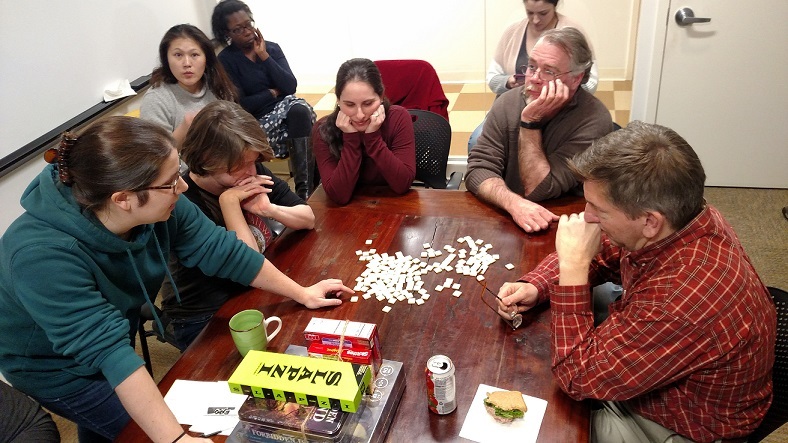 The two games also allow two different quartets to compete at the same time; as one group plays Bananagrams, the other plays On the Dot. 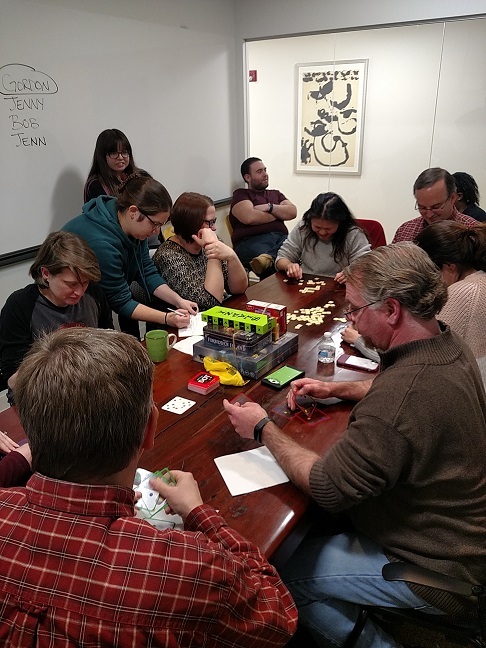 Since we only had our lunch hour to complete round 1 (and 16 competitors crammed into the conference room), time was of the essence. 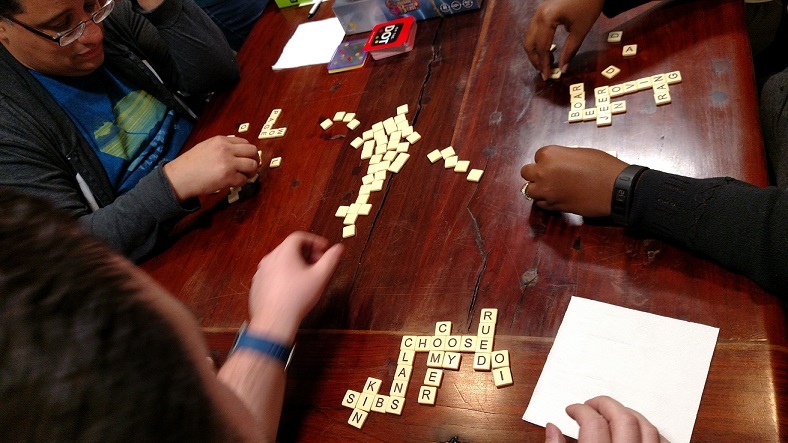 My group was first to compete in Bananagrams, and as the sole representative for PuzzleNation in the tournament, I was determined to make a strong showing for the brand. Things started off smoothly. We had 21 tiles to start with, and I quickly formed a strong anchor word with DONKEY. But before long, my puzzly competitors proved their own skills were formidable, as cries of “Peel!” began to ring out, and the tile pile quickly diminished. Honestly, I don’t think I said “Peel” once. I was always close to completing my grid, but never fast enough. But I seized my chance once the tile pile was empty. I only had a few letters left, and some quick anagramming had me confident. I called “Bananas!” and the judges came over to check my grid. But alas, I’d made an error. I had originally played the word MAKO in part of the grid, then stole the M and A to form other words, intending to come back and fix that part later. But in my overzealousness, I left KO in the grid, which is not a word, so I was disqualified. Curses! The player to my left was only about a half-second behind me, and she made no clumsy errors. Her grid was clean, and she was declared the first winner from our group to move on. I would have to try my luck at On the Dot if I hoped to salvage the day. We switched games with the other competing foursome at the table, and distributed the clear cards for the next contest: On the Dot. Although I was disappointed with my performance in Bananagrams, I remained confident going into On the Dot, since I’m fairly strong in pattern-matching and similar forms of puzzling. The first pattern to match was revealed, and we were off! On the Dot really consists of two skills: being able to place the cards so the dots are in the right places AND hiding the dots and colors you don’t need. That second part can be more difficult than simply matching the pattern, honestly. If you need a yellow dot in a certain spot and nothing near it, it’s not good enough to have a yellow dot in that spot and a purple one right beside it. I quickly cracked the first pattern, earning 1 point (and a few groans from the other competitors in my quartet). I was able to follow that with two more victories, earning three points and a clean sweep. I was officially bound for Round 2. Huzzah! Several other competitors that day turned in similarly dominating performances in On the Dot, while other rounds were hotly contested and came down to the wire. One of the games ended in a deadlock, as neither player remaining could complete their grid. Another ended in so contentious a fashion that a tiebreaker game was needed to determine a winner! Fortunately, the judges were prepared for this possibility, and a quick round of Slapzi was used to settle any such ties/issues. 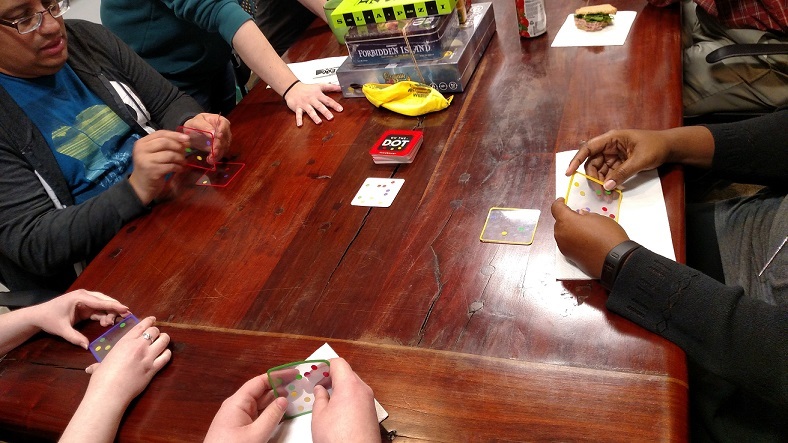 Slapzi is a quick-reaction game where each player is dealt five double-sided cards. Each card has a unique image on each side — everything from dogs and fire hydrants to ladybugs and lawnmowers. Then a description card is played — “has two syllables” or “made of wood,” for instance — and the first person to play one of their cards that matches the description drops that card from their hand. The first person to empty their hand wins. Between the three games, eight competitors moved on to round 2 (including last year’s champ), one step closer to a grand prize of a Game Night Gift Pack, complete with snacks! But that’s not all. The winner would also get a crown and scepter to carry around, in order to better lord their victory over their vanquished foes! With a prize pack and a shot at becoming Tabletop Tournament Royalty on the line, things just got a lot more interesting. 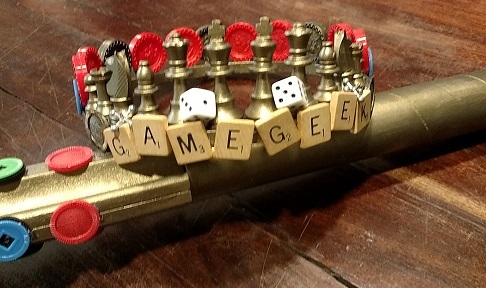 This entry was posted in Games, PuzzleNation, Puzzles and tagged 2018 puzzle grand prix, ACPT, American Crossword Puzzle Tournament, bananagrams, game night, games, Geeking Out, Holidays, Indie 500, indie 500 tournament, International TableTop Day, national tabletop day, on the dot, pattern, pattern game, pattern-matching, pattern-matching game, pdp tabletop tournament, Penny Dell Puzzles, Penny Press, Penny/Dell Puzzles, Pop culture, puzzle grand prix, PuzzleNation, Puzzlin' fool, Scrabble, slapzi, TableTop, tabletop tournament, tournament, Wordplay, World Puzzle Federation by gmdirect. Bookmark the permalink.